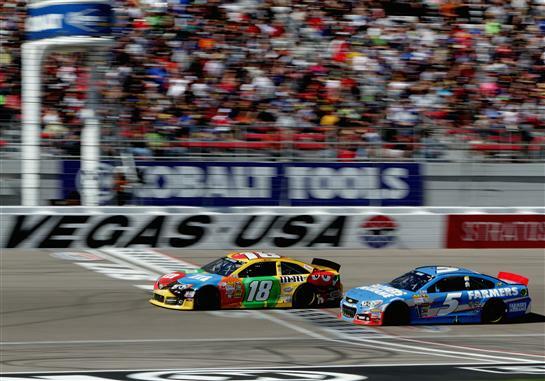 Kurt and Kyle Busch were both hoping for a good finish at their home track, Las Vegas Motor Speedway. Both brothers have been known for their talent, controversy and their attitudes, but some of you might not know how they got their start. The boys' dad took them both to the Speedway for the Dwarf Races. Kurt, age 14, drove and Kyle, age 10, was the crew chief. This was a great family bonding experience for the men in the Busch family. In 1997, Kurt was given the chance to fill the open seat of Chris Trickle’s Star Nursery No. 70. The race team went on to their first win in the Winter Heat Series and the Kurt won 1998 Auto Zone Elite Southwest Division Rookie of the year. The team also won the championship in 1999. All of that exposure got Kurt the shot to try out for a spot on the Roush Racing Truck Series team. That was all it took and Kurt has been racing ever since. He has driven for Roush, Penske and Phoenix Racing teams. He had wins and losses, ups and downs, but now finds himself on the Furniture Row Racing team. Kurt’s younger brother Kyle also made a name for himself at an early age. He started racing in the in Legend cars at the age of 13. Kyle earned two track championships at Las Vegas Motor Speedway before he progressed to racing late model cars. Kyle followed in his big brother's footsteps by racing in the Truck Series for the Roush Racing Team. By age 18, Kyle started driving for Hendricks Motor sports, then in 2008 moved to Joe Gibbs Racing where he drives the No. 18 Toyota Camry. Kurt struggled this weekend in practice, but Kyle fared better. Qualifying was cancelled due to rain and the brothers had to start the race based on 2012 points. They both had their work cut out for them, but both were up to the challenge because they wanted to do well at their home track that means so much to both of them. Kurt started 24th and Kyle started 13th. The green flag dropped at 3:18 pm ET for Brad Keselowski, Clint Bowyer, Jimmie Johnson, Kasey Kahne, Gregg Biffle, Denny Hamlin, Ricky Stenhouse Jr., Kevin Harvick, Tony Stewart, and Jeff Gordon. Even though Ricky Stenhouse Jr. was not in the Cup series last year he got to start in the seventh position due to points that Matt Kenseth earned in that car last year. 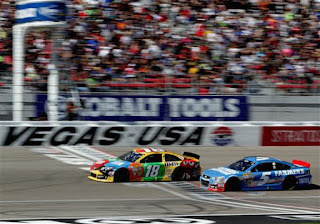 Kyle Busch started out aggressively by diving onto the apron to make a pass on two cars at one time, while Keselowski was charging ahead of Bowyer for the lead. Kahne was able to race his way to the front and take the lead from Keselowski. Bowyer faded back to 20th with a very loose car. Along with Bowyer, Stewart dropped back due to a loose car as well. However, Juan Pablo Montoya and Jamie McMurray were making strong passes to gain some spots back after they both had to start in the back of the pack due to engine changes. Greg Biffle was not able to fight with his car's handling issues any longer and had to finally pit on Lap 38 to take four tires and make a track bar adjustment. Green flag pit stops started on Lap 44, and among the takers were Kahne, Aric Almirola, Keselowski and Danica Patrick. Joey Logano and J.J. Yeley got penalties for too fast exiting pit road and Kyle Busch was penalized for too fast entering pit road. The caution flag came out for debris on the backstretch, which saved Gordon, Montoya, and McMurray from going a lap down. Meanwhile Bowyer pitted while pit lane was closed to make adjustments. After pit lane had opened, several cars did come back down pit road. The top five cars that came in left pit road in the same order. Biffle ended up with a pit road penalty for an uncontrolled tire. Teammates Johnson and Kahne battled for the lead, with Johnson high and Kahne low, abd Johnson took the lead. Teammate Dale Earnhardt Jr. was running in the top ten while Gordon continued to struggle with a ill-handling car. During the second green flag pit stops Hamlin got a penalty for too fast entering pit road and Stenhouse Jr. took the lead. Halfway through the race Kahne was challenging Johnson for the lead and was able to get it. Kurt Busch was running 23rd and Danica Patrick was 36th. Caution came out on Lap 160 when Marcos Ambrose lost control of his car and almost spun out but was able to save it. Hamlin was able to get back on the lead lap because of this caution. Johnson, Kahne, Kyle Busch, Kenseth, and Earnhardt Jr. led the cars off pit road. On the restart, Kyle Busch made it three wide, taking the lead from Johnson and dropping Kahne to third. With only 75 laps to go, there were only 15 cars on the lead lap. Stewart was lapped but continued to fight back after struggling early with a loose car. A late caution came out when Bobby Labonte spun. No other cars were involved, but Trevor Bayne and Gordon were able to take the wave around to get back on the lead lap. Hamlin stayed out on the track while others pitted. Travis Kvapil's engine blew with only 44 laps to go. Patrick, who was running right behind Kvapil, was blinded by a cloud of smoke and oil on her windshield, but maintained control. When pit road opened, Kenseth, Mark Martin, Carl Edwards, and Earnhardt Jr. were just a few of the many drivers who hit pit lane. Kenseth led on the restart with Keselowski close behind. Johnson, Edwards and Earnhardt Jr. maintained their positions to round out the top five. Ryan Newman, who hadn't been running all that strong, blew his engine to bring the caution back out. When pit lane opened, the only two drivers to drop in were Hamlin and Biffle On the restart there were only 26 laps to go. Kenseth got around Keselowski, Kahne and Kyle Busch for the lead. With two laps to go, Kenseth led with Kahne hot on his tail. As they approached lapped traffic, Kenseth urged his spotter to get the slower cars down low and out of his way so Kahne didn't get a chance to pass him. Kenseth was able to hold Kahne off to get the checkered flag. View the final results here.